On the Edit Site page ( ) is the Edit Pages section, which lists all of the pages on your organization's website. 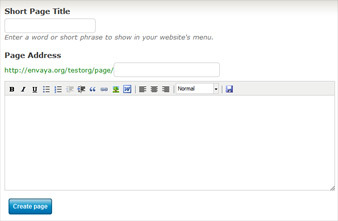 Here you can edit an existing page, change the order of pages, or add a new page to your website. The existing pages on your website are listed in bold, above the gray line, in the same order as they appear in your website's menu. To edit a page, click on its name. On the right side of the screen, there are "up arrows" which allow you to change the order of pages in your website's menu. By clicking an "up arrow", you can move the corresponding page towards the beginning of your website's menu. The page at the top of the list will be used as your website's homepage. In this box, you can write and format text and insert photos or documents. You can also copy-and-paste content from other places, such as Microsoft Word documents. : creates a link to another webpage, either on your site or somewhere else. : inserts an entire document file, such as Microsoft Word, PowerPoint, PDF, etc. : saves your changes (without publishing them), so you won't lose your work. : allows you to go back to an older version of your page. On the Edit Site page ( ), the bottom of the Edit Pages section has a list of suggested pages that you could add to your organization's website, and an Add another page link, which allows you to add any page you like. When you click Add another page, the next step is to choose a page title to display in your website's menu, and then add the content for your new page. Finally, click the Create page button to publish your new page on your website.